Responsible Government in the Territorial Legislature in 1897 led to demands for political independence. In the federal election held in 1904, both Conservatives and Liberals supported provincial status for the territories, but could not agree on how it was to be achieved. Alberta played a major role in Canada's involvement in World War II as host to many prisoner-of-war and internment camps. The officials running the internment camps forced Japanese internees to work on farms, in sawmills and in canning factories, boosting production in each of those industries during wartime. Alberta was also home to many training bases for the British Commonwealth Air Training Plan. Alberta's destiny was changed forever with the discovery of oil. The first oil field was at Turner Valley, south of Calgary where large supplies were discovered. More fields were discovered in the following years and by 1991, Alberta was producing 81% of Canada's crude oil. The oil exploration led to the discovery of large reserves of natural gas and pipelines were constructed to carry the gas east to Ontario and Quebec, and south to California. Those discoveries led to the creation of jobs in the construction, petrochemical and transportation industries. Alberta has expanded its economy into other areas as well, but oil remains its most significant industry, making its economy one of the strongest in Canada. From its rugged Rocky Mountain landscape and sprawling prairies, on to the moon-like landscape of the southern Badlands, much of the allure of Alberta lies in its landscapes and stunning scenic wilderness. Alberta is a playground for Canadian nature lovers and for those who just want to escape from urban life. 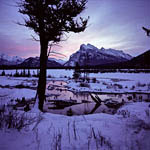 In that regard, parts of the Rocky Mountains were set aside as Banff and Jasper National Parks, for the perpetual enjoyment of residents and tourists. Alberta's two major cities, Edmonton and Calgary, provide plenty to do for visitors or locals alike, including fine theaters, art and natural history museums, and a rich nightlife. Calgary hosted the 1988 Winter Olympics, and is the home of the Calgary Stampede. Edmonton's top two attractions are Ford Edmonton Park and the West Edmonton Shopping Mall. And with no provincial sales tax, Alberta delivers an extra bonus for Canadian travelers.